للمسافرين الذين يرغبون أن يعيشو كل ما تقدمه بورت فيلا, Travellers Budget Motel هو الخيار الأمثل. إن موقعه الجيد الذي يبعد 1 km فقط عن مركز المدينة يساعد النزلاء على الاستمتاع بمعالم المدينة ونشاطاتها. إن سهولة الوصول من الفندق إلى المعالم السياحية الشهيرة الكثيرة في المدينة كمثل بورت فيلا تنس كلوب, برت د سيل, Pandanus Vanuatu Ltd هو استثنائي بحد ذاته. إن الخدمات الممتازة وحسن الضيافة العالي في Travellers Budget Motel تجعل إقامتك تجربة لا تنسى. يقدم الفندق واي فاي مجاني في جميع الغرف, أمن على مدار 24 ساعة, معبد, متجر, خدمة التنظيف يوميًا لضمان الراحة القصوى لضيوفه. بالإضافة لهذا,تتضمن كل غرف الضيوف مجموعة واسعة من وسائل الراحة . بعض الغرف توفر حتى شاي مجاني, مناشف, رف للملابس, ميزان, قهوة فورية مجانية لإرضاء أكثر الضيوف تطلباً. يقدم الفندق العديد من الفرص للاستجمام كمثل تأجير معدات الرياضات المائية, مركز للياقة البدنية, مسار جولف - ضمن 3 كم, حمام سباحة خارجي, صيد السمك. اكتشف مزيجاً ساحراً من الخدمة الاحترافية والخيارات الواسعة من وسائل الراحة والمتعة في Travellers Budget Motel. I get that I was playing for budget accommodation but to not have a fan working properly at full power on a hot and sticky humid night was not acceptable. The shower squirted water straight into your eyes because minor repairs haven't been attended to. Fridge wasn't working and dripping water on floor. Power points weren't working. Had to figure out myself that the power had tripped. Can't go to sleep much before midnight each night because of other guests outside sitting around drinking, talking and laughing. Can't shut the noise out by closing the windows because it's too hot in the room. Will definitely not stay here again. I stayed at Travellers for a couple of months while looking for a house to buy in Port Vila. The resort hotels I tried first did not work for me, due to location, poor wifi, lack of desk, and impersonal treatment. Travellers was better for all these. I also had to run my businesses in the US over the internet. What I treasured most at Travellers is the fact that its design and management foster a very natural sense of community among the guests, who were from around the world. It made it a lot more enjoyable for me than fancier, costlier hotels with no community spirit. Best motel for a stop-over or transit. Not far from beaches and airport. I stayed one night before flying to Tanna island and one night before heading back to Fiji. I had to leave for the airport at 6.30 am. Agnes prepared me breakfast since before I got up and helped me get a bus to the airport. The room facilities are great. 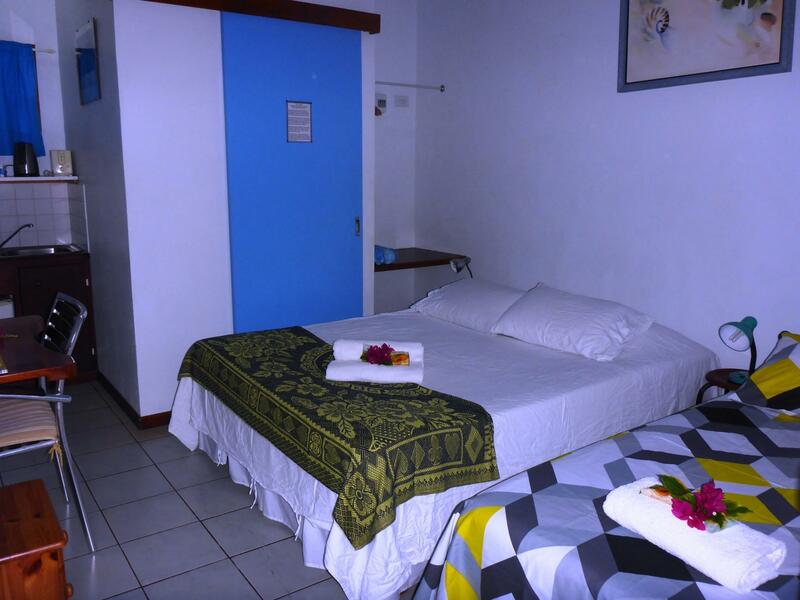 Good location as it is located near the Lookout and Tana Cine where you can get food easily. The motel is not far from the airport. Best place for a short stop-over to other islands. I would recommend this place to everybody!!!!! After arriving with a family of young children, Michael, the proprietor, took it upon himself to drive us into town and back, so that we could buy food for the children and us. To our mind, he went far beyond his call of duty. The facilities are good. Probably the best backpacker I stayed in 20 years of travelling, cheers Jack! We spent one night at Travellers Motel between a very late arrival at the airport and our next destination. We were very pleasantly surprised with the excellent communication with our hosts before arrival, and with their hospitality and helpfulness during our short stay. 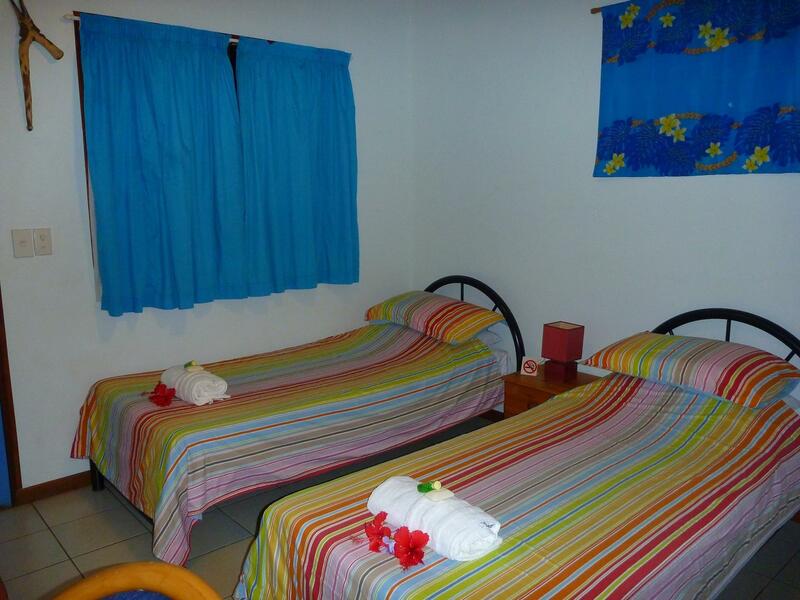 The place is clean and tidy, very reasonably priced, located only a short walk to the centre of Port Vila. Janelle and Jake are very welcoming and have lots of tips and local knowledge to share. We stayed 1 night on our way to Santo and wanted something cheap, close to town and the airport. 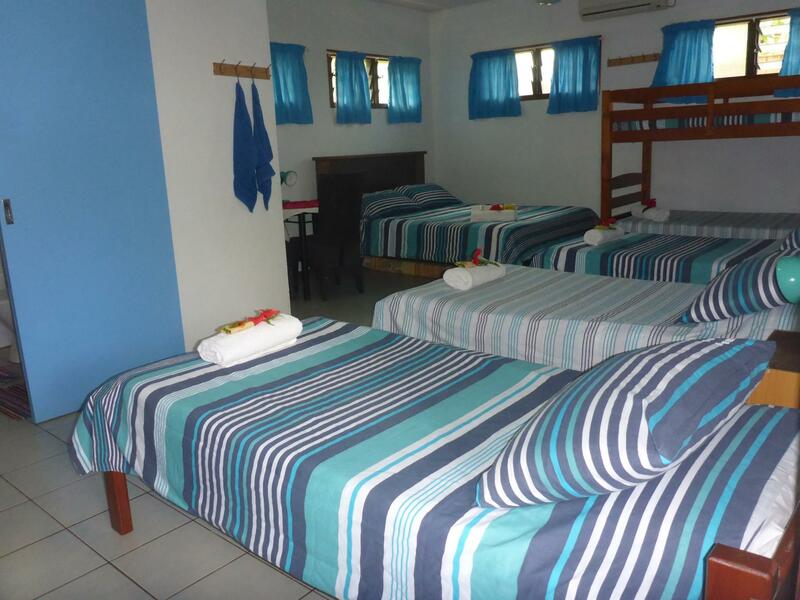 The rooms are basic with air con, fan, tv, bathroom and small kitchenette, everything you really need. The bed was a bit lumpy but ok for 1 night. Janelle and Jack make you feel extremely welcome and invite you in like you're staying at their own house. The Motel has a good pool and provides a fridge full of beer and food on request. It is located a short walk to town and 10 minutes to the airport. Don't expect a resort, it is exactly as stated a Traveller's Budget Motel. We would have no issues staying there again for a 1 night transit. I had a great time staying at The Traveller's Budget Motel. Jack and Janelle were great. Janelle recommended the tours I took which were all really good value for money and more about the locals. Jack recommended the Restaurants I visited. Great Taste. I found the room to be of perfect size. The bed was super comfy and plenty of hot water in the bathroom. Air conditioning was a bonus. The travellers staying there were full of information and get chats around the pool area. Would definitely stay here again. Thanks Jack and Janelle for making my stay wonderful. very friendly and helpful hosts. 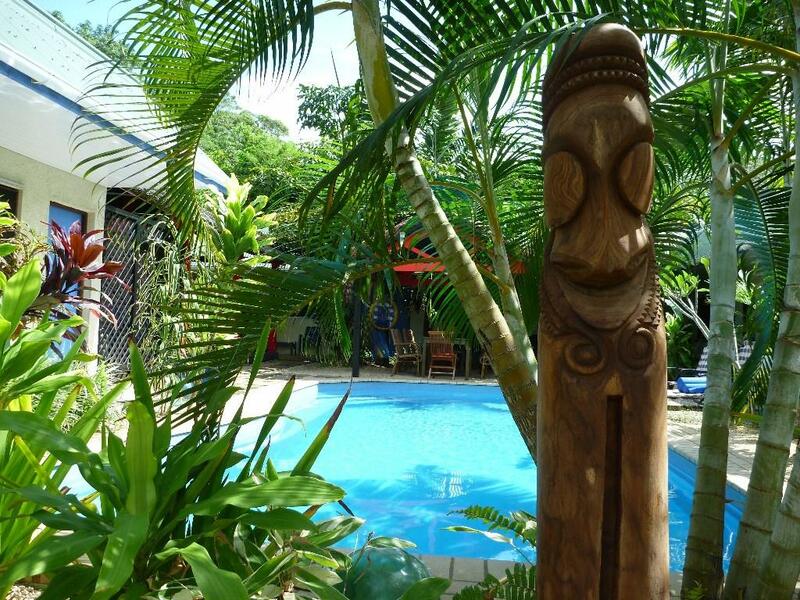 The hotel is close to the airport, so it is a good one to use for a quick stopover in Port Vila if you are planning to connect to an early flight to the islands..
Staff, breakfast, value for money. Very knowlegable and helpful staff. The owners are into local produce, local business ownership etc and are full of good suggestions for things to do etc. Breakfast is great and cheaper than in town. This is a small place with a lovely relaxed environment. Takes about 10mins to walk to town centre or 5mins on a local bus for the standard 150v fare.